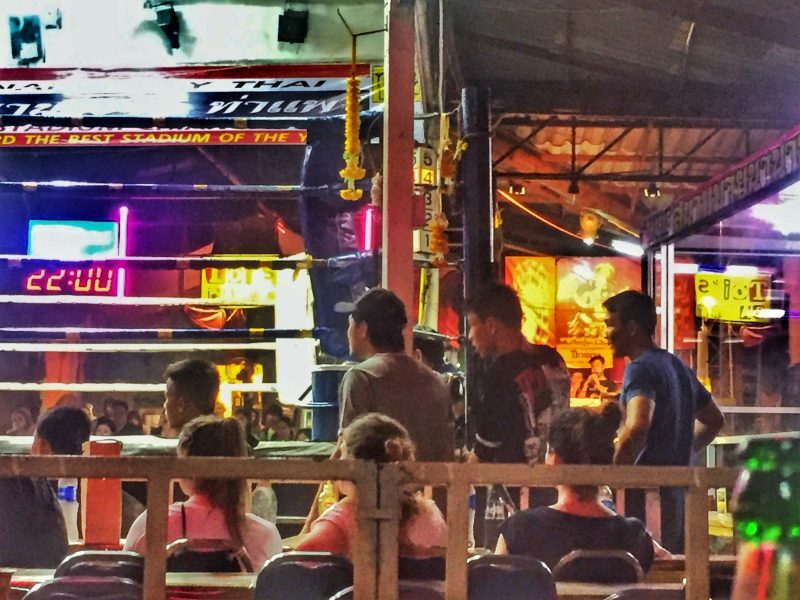 This post will let you know what you can expect to encounter when you watch Muay Thai at Thaepae Boxing Stadium in Chiang Mai (from my experience). If you’d like to jump straight to the practical details including ticket prices, click here. Some leaflets will be in colour. Some in black and white. 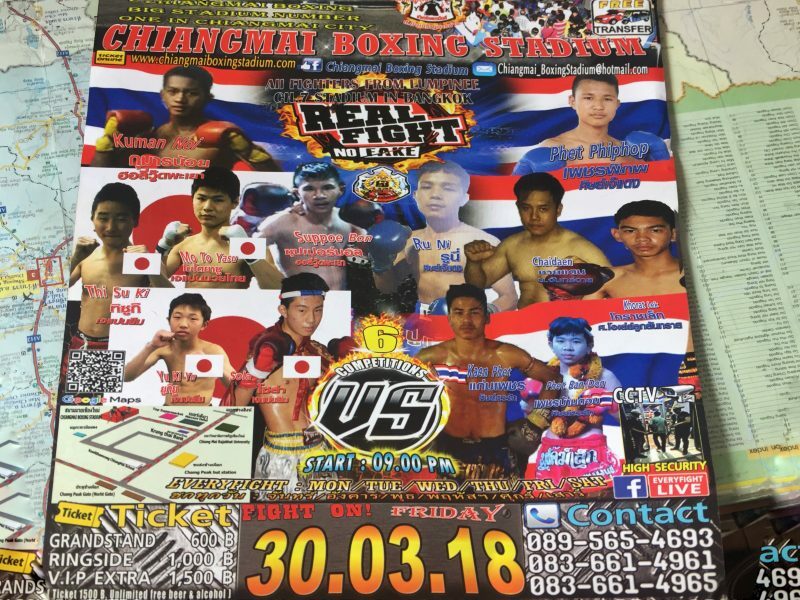 You won’t need to spend long in Chiang Mai’s Old City before you see leaflets promoting Muay Thai fight nights at Thaepae Boxing Stadium and others in the city. They’re everywhere. In restaurants, on the desk of travel agents, on signposts, and the pavement. You’ll walk a bunch of people trying to give them to you too. From a distance, they all look the same. Fighters pose with their fists up surrounded by an overwhelming amount of information. A copywriter would die a little on the inside looking at them. 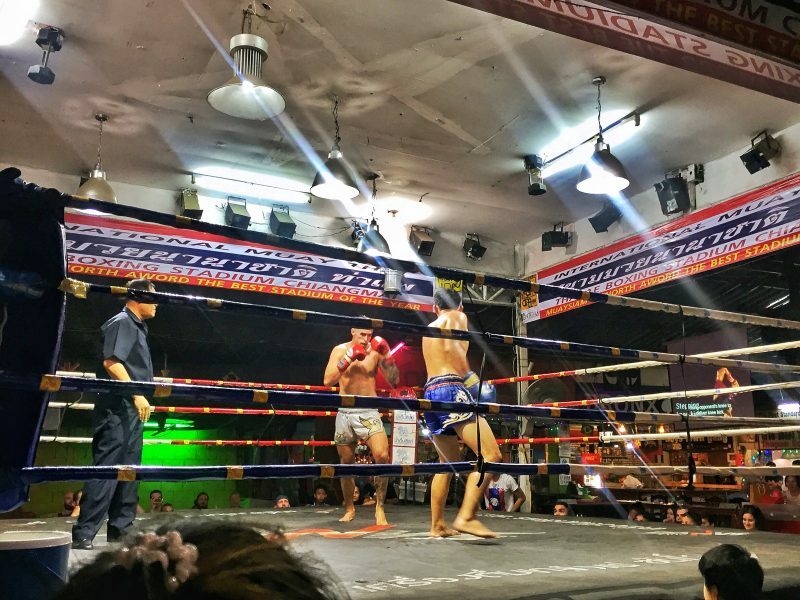 On March 29th, 2018 it was time to break my mai tai Muay Thai virginity at the cities most touristy arena, Thaepae Boxing Stadium. 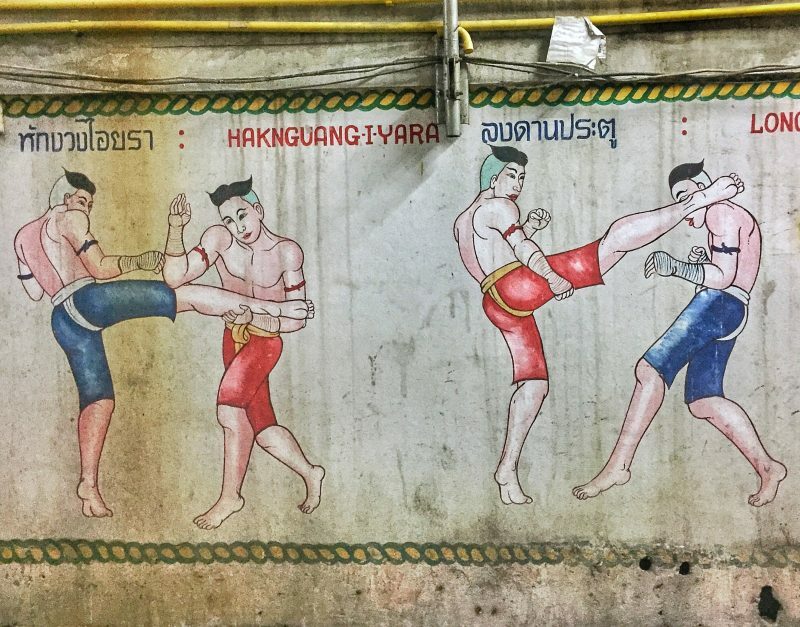 It’s the most inauthentic Muay Thai fighting experience but on the bright side, it’s the cheapest and the easiest for most tourists to access. It’s not the most glamourous entrance to a stadium. With no idea what to expect I got to the entrance at 8.45 where my buddy Andrew was waiting (leaflets say a 9 p.m. start). I thought the cheap tickets were 400 baht, but the signs at the stadium entrance said 500 baht for ‘grandstand’ seats (more pricing details below). A staff member took us to our grandstand seats with bars and restaurants on both sides of us. My favourite bar and restaurant names were Criminals Bar, Prego Pizza’s, and Burgers and Punches. The stadium grandstands aren’t what I’d called grandstand seating. Yes, they’re undercover but on ground level (no tiers) behind the higher priced ringside seats. The corrugated iron roof confirms you’re in a stadium built for the tacky tourist you and I are. You don’t have to buy a drink but the waitresses will encourage you to buy. Leo, Chang, and Singha were the same price at 120 baht for a large and 70 baht for a small. The rest of the menu was like any other alcoholic place in Thailand. FWIW, 700 baht for a large Sangsom set. Some art work featured at the entrance. 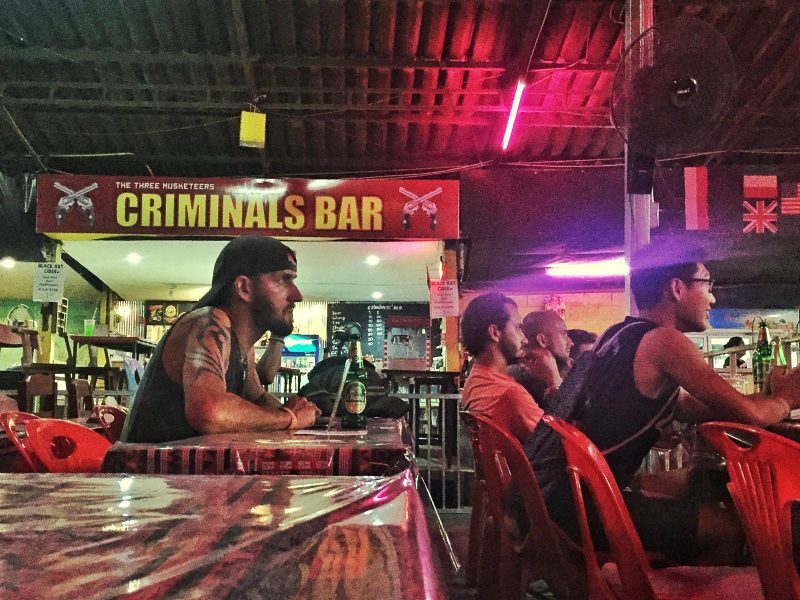 The pre-match entertainment is non-existent as a TV runs through the basics of Muay Thai. On repeat. The crowd continued to filter in with tourists split 50/50 between the ‘grandstand’ and ringside seats. At one point a lady came past with punnets of popcorn for 40 baht. The best fight for popcorn would have been the second special fight (read further below). Fight 1: At about 9.30 a couple of kids, 80 pounds max dripping wet climbed over the top rope into the ring. Is ego their enemy already or are they kids at heart replicating WWE wrestlers they see on TV? As the first fight kicked off a live announcer was switching between Thai and English. The stadium’s non-existent acoustics make him pretty much inaudible. It’s awkward to watch the kids fight. They had solid technique, but how often should a kid be getting kicked in the head (without headgear)? That’s coming from a kiwi who dislikes the PC behaviour destroying rugby growing up in NZ. The fight ended in round 3 with a TKO. Fight 2: The second fight got underway shortly after with the fighters closer to the 102 pounds mentioned on the fight schedule. Once again they were well drilled with their pre-match routine and solid technique. Blue struggled with the height difference between red and lost by decision. Red’s name was iPhone. Note: I know nothing about Muay Thai. Their technique could be crap but it did look good to me. Fight 3: Fight three saw the fights increase in size again. The guy in red had an ego about him that Ryan Holliday, author of Ego is the Enemy, would shake his head at. He scored a knockout in the third round. I’m 93% confident this was staged. Out of nowhere, the blue fighter tumbled to the ground in a heap. A couple of people came to his aid but no more than 30 seconds later he was up and out of the ring unaided. So bizarre. I’m calling fake. Fight 4: Fight 4 was the main event of the evening. It wasn’t the most exciting fight with a blue victory again. You can watch one of the rounds on a video I uploaded. Fight 5: The special fights. The first had was two guys performing a sword fight. Their demonstration was impressive as they told the story of a battle, sparks flying when the swords connected. The second special fight saw four blindfolded guys let loose in the ring for 5 minutes. There were some funny moments with one guy throwing wild haymakers that didn’t connect. A fun few moments soured for me when they came asking for tips. Fight 6: the one women’s fight. An America girl versus a Chinese girl. From the opening bell, the fight looked like a mismatch. With the American defending the Chinese fighter was aggressive. In the second round a cut above the Americans eye stopped the fight for 30 seconds. That was the beginning of the end with a TKO in blues favour (China) when the cut opened up again. Fight 7: The last fight saw the two biggest lads of the night go at it. One from Thailand and one from the Czech Republic. They had a pretty even fight with the Thai guy starting off stronger before the CR guy coming home stronger. The fight went to a decision and the Thai guy won. I’m not so sure about that decision but who am I to argue. With the final fight complete we exited at around 11.30 p.m. 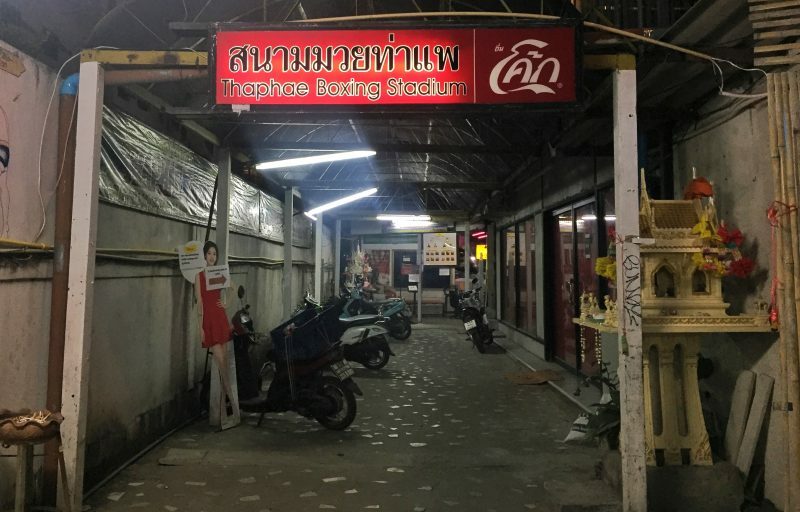 The Best Place To Buy Tickets For ThaePae Boxing Stadium? We bought our tickets at the door (pricing below). To get them cheaper I would recommend is too buying them earlier in the day from a travel agent or even ask if your accommodation can help out. 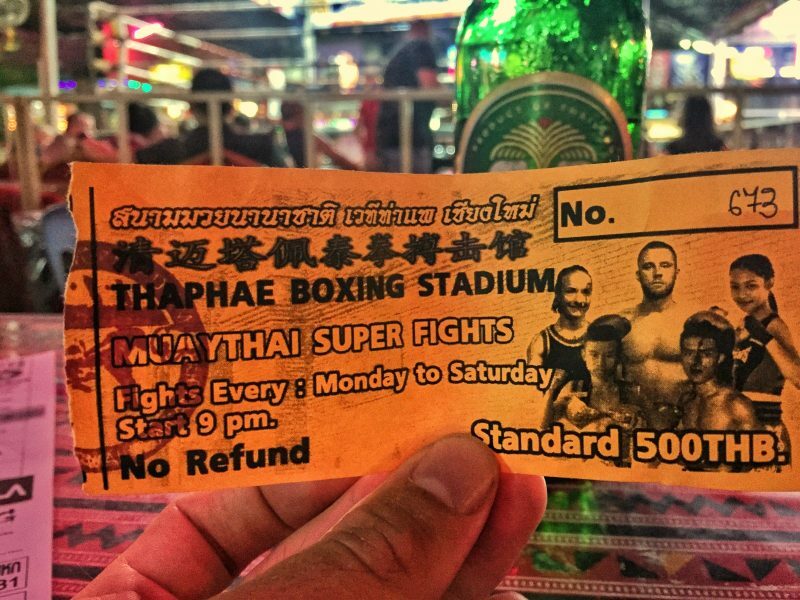 How Much Do Tickets To The Thaepae Gate Muay Thai Cost? If you aren’t looking for the stadium you’d miss it but it’s here, right by Thaepae Gate here. Do I Need To Buy A Beer? Nope, there’s no obligation to buy drinks. There are coke and other non-alcoholic beverages available. I’d stick to buying food before the event as it looks like the places open based on demand so you might end up hungry. Everything says that it starts at 9 p.m. I’d recommend getting there at 8.45 – 8.50ish so you have a choice of seats. The fights didn’t start until 9.25 p.m. (normal?) and the last fight finished around 11.30 p.m.
How Many Rounds Are The Fights? It was tricky to work out. From what we gathered, all fights were five rounds long with ~3 minute rounds. I put the ~ in there because I video’d one round and it was 2.50 minutes. Is Sitting Ringside Worth It? In my opinion, yes. You get to see a lot more up close. Not to say the grandstand seats are bad but the ringside seats are way closer to the action. If you’re on a tight budget choose the grandstand tickets. Hmmmm Jub…bold assumption about those people in the photo up top LOL 😉 Probably not criminal but with their rough look in Bangkok, ya never know. Sounds like a fun time! We pondered seeing a few of these matches but never did. May be in store for a return trip to Thailand and Bangkok, which is always a possibility.